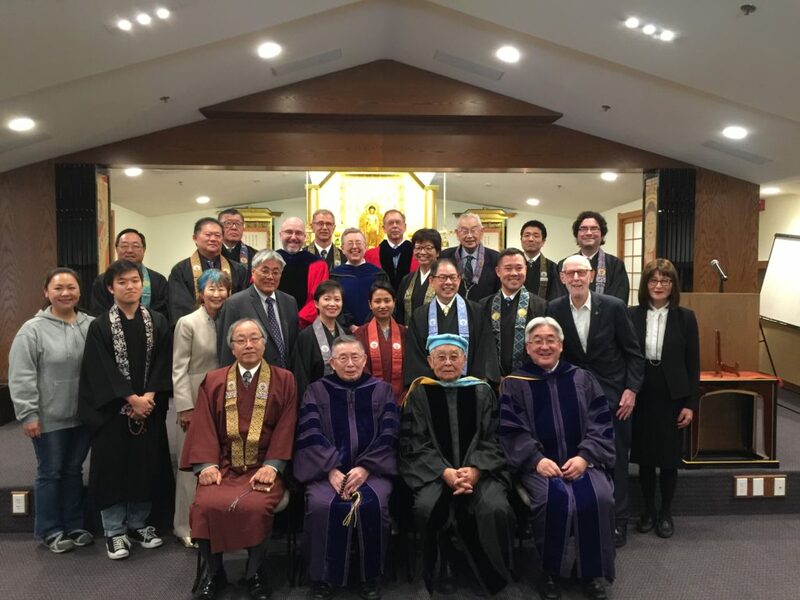 The service began with introductions by Dr. Matsumoto, followed by a service led by ministers with audience participation, and opening remarks by Dr. Scott Mitchell, IBS Dean. Dr. Fujimoto was presented the President’s Award for his services in providing academic and organizational leadership, for faculty, curriculum development, and establishing fund raising goals. He coordinated the process for IBS to affiliate with the Graduate Theological Union, upgrade the faculty, and established professorial chairs for the faculty. He guided IBS in raising its standards with the ultimate goal of attaining the Western Association of Schools and Colleges (WASC) accreditation. His leadership has brought IBS one step closer to achieving that goal. Dr. Fujimoto expressed his gratitude for being given the opportunity by serve IBS, and wished the current faculty, staff, and trustees success in their endeavors to make IBS a recognized educational institution. Rev. Harry Bridge, minister of the Buddhist Church of Oakland and an IBS graduate, gave the commencement address titled, “A journey with Vasubandhu.” After looking at some key ideas from the Jodoron, Vasubandhu’s Treaties on the Pure Land, he concluded by expressing his gratitude to his teachers, students, and colleagues, recognizing that life is a continual process of learning, both about the Dharma and himself. Tadao Hiramoto Koyama was awarded the Master of Buddhist Studies. His thesis title was, Chanting in Buddhism: With a focus on Chanting in the Jodo Shinshu Tradition. Thesis committee: Dr. Matsumoto and Dr. Mitchell. Koyama is currently in Japan to further his studies. His parents, Mr. and Mrs. Kenneth and Stacey Koyama, received the degree on his behalf. Kyoshi Certificates were awarded to: Blayne M. Higa, Carmela Javellana Hirano, and David R. Pating, Unable to attend were: Ellen Hamada Crane, Robert Anraku Gubenco, and Todd T. Tsuchiya. IBS Exchange Program certificates were presented to Uma Lama Ghising and Satoshi Shaku of Ryukoku University and WenYe Lu of Dharma Drum Institute of Liberal Arts. Front Row: Bishop Kodo Umezu, Dr. Seigen Yamaoka, Dr. Jack Fujimoto, and Dr. David Matsumoto. Second Row: Wen-Yi Lu, Satoshi Shaku, Stacey Koyama, Kenneth Koyama, Carmela Javellana Hirano, UmaLama Ghising, David R. Pating, Blayne M. Higa, Dr. Gorden Bermant, , and Hoshina Seki. Third Row: Rev. Marvin Harada, Rev. Jerry Hirano, Dr. Scott Mitchell, Dr. Daijaku Kinst, and Rev. Patricia Usuki. Fourth Row: Rev, Gerald Sakamoto, Rev. Gregory Gibbs, Dr. Richard Payne, Richard Endo, Rev. Kiyonobu Kuwahara, and Rev. Harry Bridge.